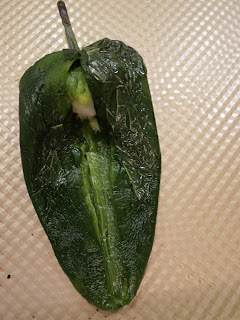 Brush the poblano peppers with olive oil. I use a small silicone brush for this, but if you don't have one, you can just use your hands to rub oil around the pepper. The instructions in the cookbook state the following: With a long fork or tongs, cook the peppers over an open flame, turning often, until the skin is charred all over, about 5 minutes per side. I don't know about you, but I don't have an open flame in my kitchen so instead, I broiled the peppers. (The first mistake they make is not offering options.) If broiling, preheat the oven on the broil setting. Put your peppers on a broiler pan and put them in the oven. Cook for 5 minutes, then turn and cook another 5 minutes until the skin is bubbling. Remove from oven and place the peppers in a large bowl. Cover with plastic wrap and let cool. Once the peppers are cool, peel off the skins. Make a lengthwise slit in the peppers and pull the seeds out. I found this difficult and decided to rinse the peppers under water to get all the seeds out of them. Once the seeds have been removed, set them aside. In a saute pan, heat 2 tablespoons of the olive oil over medium heat. Add the mushrooms and saute for 5 minutes. Add the scallions, zucchini, corn, and salt and saute until just tender about 5 minutes. Crumble the grilled tempeh into the pan and cook for an additional 3 minutes. (The book did not instruct one to crumble the tempeh - second mistake). Mix everything together and let cool. Meanwhile, put the remaining 1 tablespoon of olive oil and the onion, stock, and a pinch of salt in a saucepan. Add the rice and bring to a boil. Decrease the heat, cover, and simmer for 25 minutes. Add the bell pepper and simmer until the rice is tender, 10 to 15 more minutes. Transfer to a large bowl, add the vegetable mixture and mix everything together. Preheat the oven to 350-degrees. Stuff each pepper through the slit with the vegetable and rice mixture. Bake for 10 to 20 minutes, until heated through. I wish I had only baked them for 10 minutes as they seemed overdone after 20 minutes so just keep checking them until they are done. Serve with Roasted Red Bell Pepper and Tomato Sauce and Sauteed Swiss Chard. This recipe was delicious. The mixture in the pepper was divine! The only thing I might change in the future is using another type of paprika in the tomato sauce other than smoked as that flavor seemed to be a bit much for this dish. Other than that, it was like eating at Candle 79, but in my dining room! Bon appetit!